No less than the Queen of Pop, Ms Pops Fernandez and the pop ballad singer, Joey Generoso, team up to lead the midnight countdown this New Year's Eve at the Solaire Resort & Casino. Dubbed as Toast! Solaire Countdown to 2014, Solaire’s very first new year countdown is surely going to be one giant house of fun as the first team up between the two pop icons is expected to rock performances! Remember the songs Hold On, Tell Me, Ang Aking Awitin, So Many Questions and Forevermore that topbilled the airwave charts? No other group in the Philippines was able to match Side A's track record in the '90s in terms of commercial success that the group was referred to as the Philippines' Toto. Joey Generoso was the frontman of the veteran pop rock group Side A before going solo. The pop ballad singer had since realized his dream of releasing a solo album entitled “Stand”. According to Joey, his song “Stand” talks about standing up when life is thrown out of balance. Our attitude towards the obstacles we face determines the result and he would like to dedicate this meaningful song to the victims of Yolanda and recent catastrophes that hit our country. 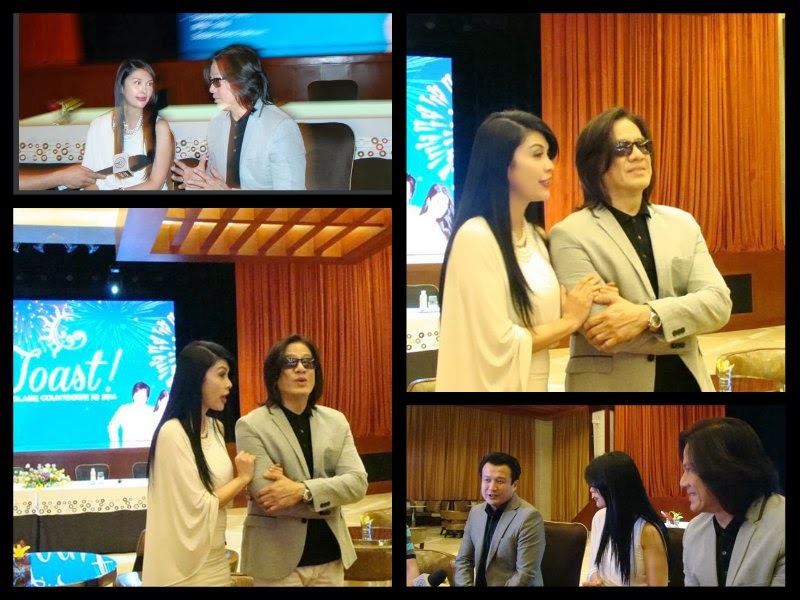 On the other hand, Pops relays that she is excited with her first concert collaboration with Joey Generoso. There are lots of surprises in the upcoming show that the audiences will be able to relate to as their repertoire would be a trip down memory lane. The New Year symbolizes hope and new opportunities for a prosperous beginnings. “When problems come my way, I always look forward to a new day,” she shares. “I go to bed with the thought that tomorrow will be a better day.” New Year Countdown is one of those occasions that everyone all around the globe look forward to. Party non-stop! Catch the fireworks as Solaire celebrates it New Year's Eve countdown on December 31, 2013 with Pops and Joey G.
Toast! Solaire Countdown to 2014 ticket prices are pegged at 10,000 pesos, 6500 pesos and 4500 pesos. Interested parties may get it from ticketworld, ticketnet and Solaire. Wow, this is actually a good show. Unfortunately, the husband is on duty during the holidays; one of the not-so-nice things about being in service. Hehe. Both Pops and Joey are very talented artists. Kudos to Solaire for bringing them together! Solaire stepped up thier New Year countdown! I've never actually attended an NYE event because we always have a party with the family on that night. But this one sounds like it's gonna be a great show.